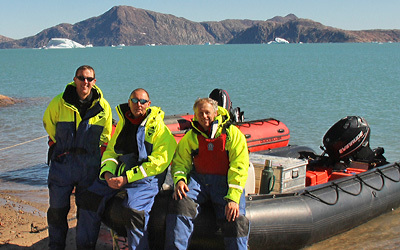 After flying into Constable Point, the majority of transport to your expedition base camp or start point takes place by snowmobile (March - May) or boat (July - August). Outside of these times, most regions are only accessible by helicopter, due to unstable sea ice conditions. Tangent has a fleet of snowmobiles permanently based at Constable Point. These will be used to transport you to your expedition's start point. Depending on the location, this can take anything from 20 minutes to a full day or two. The 'doos' travel at around 50 km/h, meaning you'll have to wrap up warmly to avoid the wind chill. We have some overalls available to help. You'll either ride on the back of a snowmobile, behind the driver, or in one of our special passenger sleds towed behind. 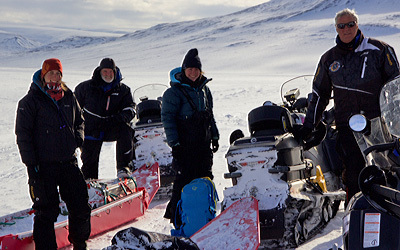 The 'Snowdragons' are our team of dedicated snowmobile drivers. All are fully trained in both snowmobile driving and Arctic conditions, and will look after you both at Tangent's base and whilst transporting you. At the end of your expedition, you can expect some friendly faces to appear, ready to take you back to Constable Point. During the summer months Tangent uses it’s own two SIB boats to carry out local transport launching from a small beach at Constable Point: a 5.4m Zodiac Mk4 with 65hp engine and a Quicksilver HD480 with 60hp. Trips across the fjord to Liverpool Land take only an hour or so journey time, whilst locations further afield as far as Sydkap, Stauning Alps, Renland and Milne Land can take 2 days. Full safety equipment including immersion suits and bouyancy aids is included. For even longer journeys of up to 300kms we use a larger boat “Johanne” operated by a good local friend and it is the largest boat of it’s kind in the district.